SCHIZOPHRENIA - The language of the hands! A 'phantom picture' for the hand in schizophrenia. Multi-Perspective Palm Reading describes the full perspective for the hand in schizoprenia: all 7 hand-perspectives are involved. However, especially the hand lines & dermatoglyhics plays a significant role! Schizophrenia is a complex mental disorder which affects about 1% of people worldwide. People who suffer from schizophrenia experience problems perceiving the difference between real and unreal experiences – which results in psychotic experiences. And as a consequence schizophrenic people also are not able to think logically, to have normal emotional responses, and to behave normally in social situations. A phantom picture for the hand in schizophrenia! How to make a Palm Reading assessment for the hand in schizophrenia? Re: SCHIZOPHRENIA - The language of the hands! I especially like all the resouces and links provided on your web page! Remarkable reading Martijn. What research! Ah and I thought my Sydney line meant that I was to enjoy a very long time frame to use my mental faculties! There's no dementia in my family tree. Hello Patti & Nona... both of you: thanks for your feedback! PS. Another member of this forum is working on a new study focussed on the hands in a sample of schizophrenics in Israel. I hope she will be able to share her results as well when her study is finished. 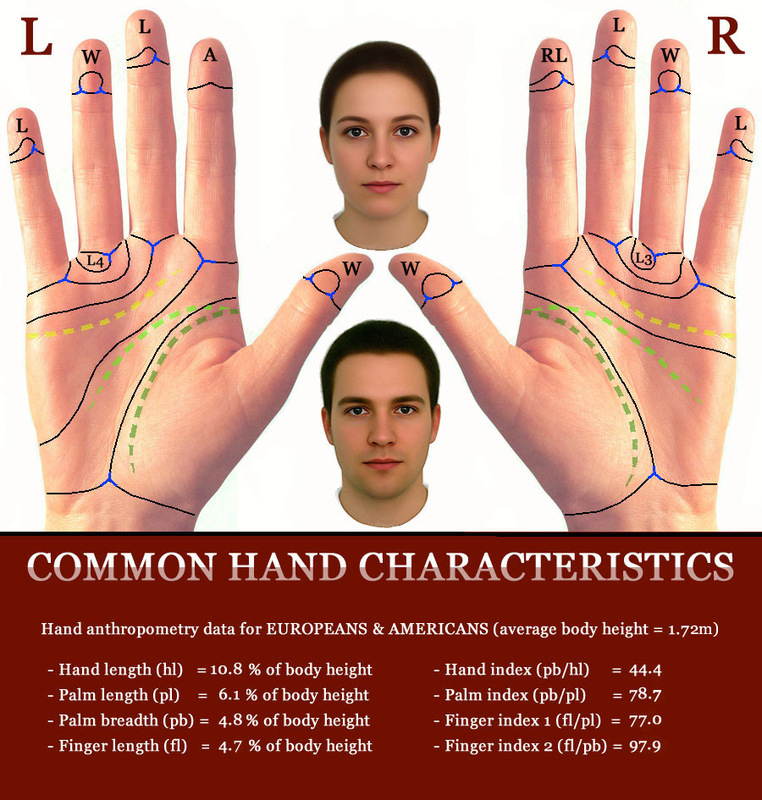 This article comes very close to how hand characteristics are assessed in the field of hand reading. The article is e.g. 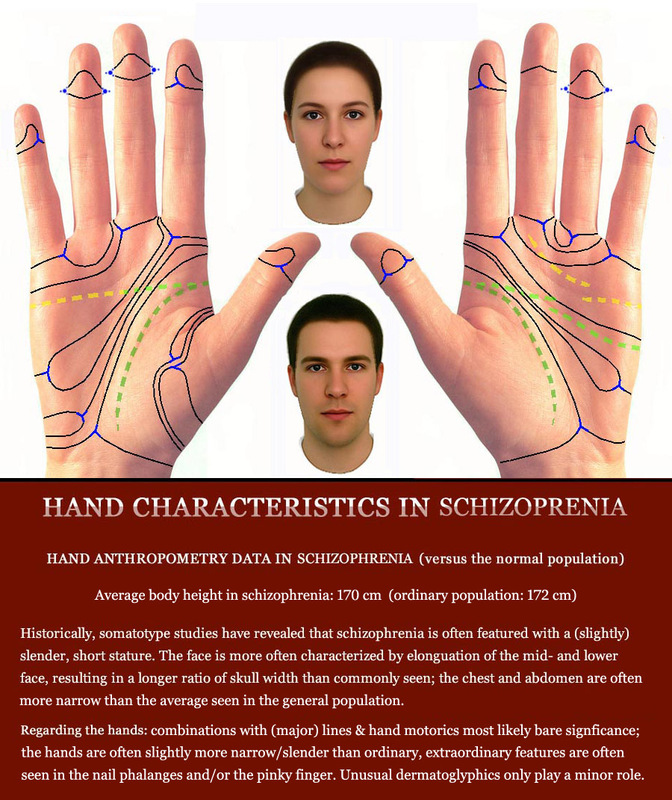 featured with a few illustrations of hands of people who suffer from schizophrenia (though unfortunately the quality of those materials is not very good). Anat informed me that she is collecting handprints, photos and scans of people who suffer on schizophrenia (and also strives for family members to be included in the study). Her sample is growing slowly (about 10 cases so far). Obviously, her project includes a thorough approach... but it will probably take a while before she will be able to present any results. A nailfold characteristic in Schizophrenia! Can you see the little blood vessels in the proximal nailfold in the picture above? Well, this has been known for decades as a typical skin marker for the so-called 'negative symptoms' in schizophrenia - which typically manifest as deficits of normal emotional responses or of other thought processes! A high level of nailfold plexus visibility (NPV) is rare in the general population (occurring in 3-7% of healthy adults) while the rate of high NPV ranges from 20-70% in populations with schizophrenia. In other populations with severe psychopathology it is only slightly more common than in the general population. Martijn, I think your multi-perspective palm reading articles are amazing. What a fantastic innovation! So far, as you know, I checked some of them against palm prints of people that I knew were suffering from diabetes, Down's syndrome and your checklist diagnosed their condition from their hands! I have yet to check the schizophrenia one, but have no reason to doubt it. Brilliant!! Thanks for this info about blood vessels in the proximal nailfold in schizophrenia, I have never heard about this before. I must contact Anat to see if she has heard about a previous study about schizophrenia in Israel, done by a lady called Talma Brill who I met at a Cheirological Society weekend seminar on "Mental health & Mental handicap as seen in the hands" in 1998. (I presented a paper about the work of Charlotte Wolff from "The hand in Psychological Diagnosis"). This area of study fascinates me. A just read that schizophrenia is often featured with 'aggregability' of the red blood cells (= clustering), I think this could partly explain why the blood vessels show up! PS. Great to hear that you have been able to discover for multiple topics that the guidelines described by 'Multi-Perspective Palm Reading' work quite well! Hand clues for schizophrenia are typically found at the tip of the fingers! Schizophrenia manifests more often than any other disorder at the tips of the fingers! Guess what? Many studies have revealed that syndromes & diseases become manifest in hand functions & many aspects in the morphology of the hands. Interestingly, a closer look a the studies performed so far indicates that for the hand in schizophrenia the significance of the fingertips is much more important than in other disorders! The materials indicate that a significant part of the correlations between the hands & schizophrenia is indeed found at the fingertips - involving at least 5 dimensions of the fingertips... while in other disorders typically only 2 dimensions of the fingertips are involved! This leads to the conclusion: hand clues for schizophrenia are typically found at the tip of the fingers!!! Wonderful resource! Thank you Martijn. I have a friend who is a leading neuro-psychiatrist and I will try and see if he can also start observing these markers. Until recently he was very adverse in his reaction to palm analysis but is now looking at it with a more open mind. I have mentioned in previous posts one of the classic hands that I am aware of was a Solomon Islander who had remarkable hands, long and sinuous, fine skin, as well as an incredibly short headline and remarkable mystical crosses across his hand. Is there any physiological explanation for these crosses in relation to areas of the brain? Sadly I don't have hand prints of the people (and don't feel I want to renew acquaintance) with whom I have had readings who are suffering severe psychosis as I have to confess it is so easy for them to become fixated on me as I have experienced and this is frightening as well as intimidating. I am wondering if the lines represent some mathematical quotient for ratios of various centres. Perhaps the left/right lobes activity reflected in the headline/proximal crease for instance. The downward line to the sublunar mount indicating the comparative activity of the right frontal lobe, or the Mount of Venus being one aspect of the Eros/Thanatos in relation to the hypothalamus? Probably sounds silly but a thought. Another has quite a obvious composite loop on the subthenar mount. But I had at that time no understanding of the use of your check list and will try and use this to be able to give more useful observations in future. I wonder whether the heavy loading of sugar in our diet aggravates the problem as I remember Rudolph Steiner pointing out many years ago that sugar encourages the aggregation of red blood cells? Interestingly, many clairvoyants I know have similar characteristics, but not all of the indicators. My father always used to say I had a form of schizophrenia when as a child I spent much time in an imaginary world, but which is more of a capacity for precognition and mediumship- to my great relief I failed the test! - well I hope my father was wrong anyway! My father and sister were doctors of some repute. I am fascinated as to the blood vessels in the fingertips. I was wondering if there is any change when they are on lithium treatment? Hi Felicity, thank you for your thankful words! Regarding the hands of the Solomonder that you mentioned, the ''long and sinuous, fine skin'' belong to the typical markers in schizophrenia (though one really has to find more than that in order to make a connection with schizophrenia). And yes that's correct: the 'subthenar' dermatoglyphic marker in the 2nd person that you mentioned is another typical marker. Sorry, I usually do not adress much meaning to 'signs' in general... and I always prefer to actually see the 'signs' before I can comment (because I have the opinion that signs can only be understood thoroughly as 'energy markers'... but a study of the exact structucture is required - though I think these 'energy markers' are very personal, and therefore probably not relevant in the perspective of schizophrenia). Regarding the brain lobes, I think that only multiple hand characteristics can (potentially) signal brain disorders. I think it is quite unlikely that there is any specific connection between the head line and any part of the brain... because I think at the end, only COMBINATIONS of hand markers can bare significance. Felicity, regarding your father's comments... I think he may not have been aware that there is huge difference between a child's fantasy & hallucinations in schizophrenia: only in the latter the person is 'suffering' - big difference! Finally, regarding your question about the effect of lithium on the visibilty blood vessels... I have hardly any expertise regarding pharmaceutics, but I would not be surprized if it could make the blood vessel problem MORE appearant - though this is only speculation from my side (but I expect that the effects of Lithium could e.g. include a narrowing of the blood vessels). In your research on the blood vessels at the proximal nail fold of those with schizophrenia, did you come across the details that may have shown it was self done rather than a condition that appears on it's own. Recently, I read an article in regards to nervous tics and habits, that some people with nervous and mental disorders push the cuticle back repeatedly to the point of damaging the nail and the cuticle. Last night I watched an interview with a brilliant news journalist, Christiane Amanpour on CNN. Several times she absent mindedly pushed and rubbed the proximal area of her nails. Most of the time she sat with her elbows on the table and hands folded in front of her, fingers interlocked. Sometimes close ups showed this area slightly pinker than the other portions of the nail. Obviously she's not a disturbed individual - rather more likely a high energy person. I was reading all the signs to look for in schizophrenia and unless I missed it I don't see the water droplets mentioned. jeanette wrote: I was reading all the signs to look for in schizophrenia and unless I missed it I don't see the water droplets mentioned. I asked Parender if this extra heart line is a crease and not the girdle of venus, but he has not answered. No, this blood vessel condition is not related to self-injury or nervouis tics. There is no mutilation of the outer skin involved. The nail folds have a high level of sensitivity so I can understand how this fits in with some schizophrenic behavior. Have you found any links to information that shows the actual cause? "Overall, these results support the hypothesis that high NPV is a marker of risk for a distinct subtype of schizophrenia." This abstract mentions the heritability factor in immediate family members. I wonder if these vessels so close to the surface would also relate to nerves closer to the surface. Are they extra sensitive to outside stimulation - or no particular sensation - like petechiae, do you know? Yes, the link between nail fold plexus & schizophrenia is focussed on the so-called 'negative symptoms' - which typically manifest in the cataonic subtype of schizophrenia. I have found no evidence/indications that nail fold plexus also directly induces a nerve related problem (but I have not studied all details in those stuidies, though it would make sense if there is such a connection). I've only once read the hands of a catatonic schizophrenic (at the request of his mother). He simply allowed me to read his hands in a very surrendering fashion. Didn't speak a word. Seemed to hear me, but no response or reaction. This was about 20 years ago, so I don't recall the hands except for long fingers and knotty knuckles. I have often seen red swollen cuticles from rubbing, usually on teenagers. Usually nail biters, too. I have never seen the blood vessels showing as in these images, so I'm thinking they must be representative of severe or extreme cases of people who do not socialize. Recently, I have been watching for the markers for schizophrenia in people's hands. Since I am reading the general population of average to above average functioning people and not institutionalized patients, I am aware there will be differences. Yet, like the Simian and Sydney (and Suwon) these markers for schizophrenia are also found on normal people. Oddly, over the years, one of the comments I say to people with hands that do not match each other is they 'talk to themselves'. Not exactly 'hearing voices', they know it's their own voice doing the 'self talking'. Last night for instance, while reading a group of very successful individuals, I read (and photographed) the hands of a woman with arches and loops on one hand and whorls and loops on the other. Both thumbs had rare radial patterns. A large horizontal radial loop on one thumb (looked like an arch at a glance) and a radial peacock on the other. Her creases were different in each hand in the sense of having an open head/life line connection in one and closed in the other as well as other minor differences. She was quite normal, I didn't ask if schizophrenia or other mental disorders was in the family. Her hands were also strong and not long and narrow. This is just one example, but I am noticing that mismatched dgs and creases between hands are also common among people who function just fine in the world. People who 'talk to themselves' is just common behavior - especially in young children! Nevertheless, despite that it is common behavior.. adults usually avoid to do that (especially when they are not alone). So, I don't see any connection with schizophrenia - because one can not associate that with psychotic and/or the kind of inappropriate behavior that is typically seen in schizophrenia. 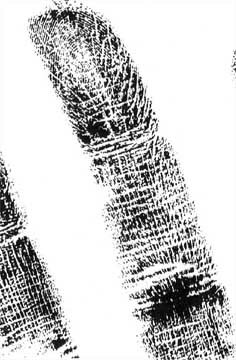 Regarding the fingerprint asymmetries, before one can associate them with schizophrenia.... one requires to observe the presence of other significant characteristics for schizophrenia in multiple perspectives of the hand (including multiple other dermatoglyphic characteristics...!). By the way, R-L asymmetry in the starting point of the head line is a relatively common hand characteristic - so far I have found no indication that it correlates with schizophrenia. So, in the perspective of the guidelines that I have presented so far that specific characteristic does not provide an extra clue to associate the fingerprint asymmetries with schizophrenia. By the way, regarding asymmetries in schizophrenia: AB-ridge count asymmetry (higher than 5) is the only other 'asymmetry-related factor' that I have identified as a significant element for schizophrenia. In my guidelines for 'the language of the hand in schizophrenia' I have described that regarding the dermatoglyphics one has to find at least 3 of the 10 characteristics that I have listed... before it would make sense to start exploring the other perspectives of the hand, etc. Does this make sense with what I have described in my articles so far? Could you post the 10 factors here on this Topic so we don't have to search for them in the various links you've posted here? Thanks - and then I will answer your question as I was mainly counting the number of obvious differences between the hands such as major creases and dermatoglyphics. - Palm: ridge dissociation ('string of pearl type'). - Palm: large ab ridge count fluctuating asymmetry: [LABRC - RABRC] > 5." NOTICE: My guidelines state that 3 of these 10 characteristcs require to be present before one can describe them as 'significant for schizophrenia'; also... be aware that at least 3 other perspectives of the hand require to be 'signficant' as well before one can speak of a hand-diagnosis for schizophrenia. Would an 'abortive c line' be the same as a tented arch pattern under the ring finger?